DunkaRoos were a snack food first launched in 1988. Each package contained several cookies and icing. You were to dunk the cookies in the icing and enjoy. Flavors included Chocolate Cookies with Vanilla icing, Graham Cookies with Chocolate icing or Chocolate-Chip Graham cookies with Rainbow Sprinkle icing. The product’s mascot was Sydney, a kangaroo voiced by John Cameron Mitchell. 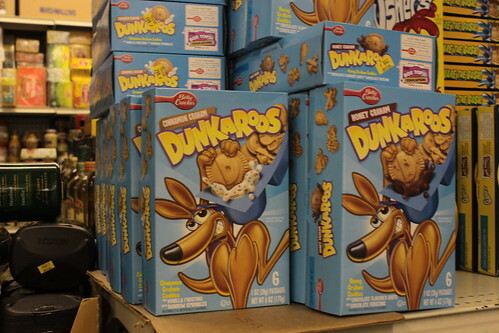 In 1996, during the height of its popularity, a contest was held — Dunk-a-Roos Kangaroo Kanga-Who Search — resulting in a new mascot, Duncan, the daredevil. DunkaRoos are still available, but they are much more difficult to find.